Call it one giant leap for mankind's search for life on other planets. Researchers now have the first conclusive evidence of water on a planet outside our solar system, according to a paper in today's issue of the journal Nature. The planet, called HD 189733b, revolves around a bright star 64 light years from Earth. 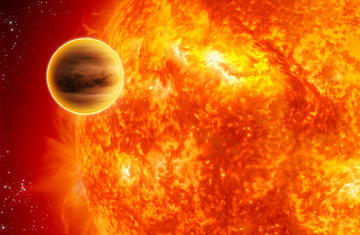 Scientists refer to the planet as a "hot Jupiter" (it's similar to but slightly larger than Jupiter  and keeps a much tighter orbit around its sun, ensuring a scorching climate). And they have examined it for water before. But earlier tests of the planet's atmosphere yielded uncertain results, so this time, astrophysicists tried something slightly different. When HD 189733b was passing in front of its sun, they observed the way electromagnetic radiation was absorbed by the planet's atmosphere. The authors of the current Nature paper analyzed wavelength variations in the infrared spectrum, rather than in the visible-light spectrum, where previous results had suggested but not proven the presence of water. "The signature in the infrared is much more distinctive," says lead researcher Giovanna Tinetti, a European Space Agency fellow now at University College London. Using measurements taken by NASA's Spitzer Space Telescope, Tinetti and her team clearly found in the wavelength variation pattern the three bands that signify water. For most of us back on Earth, the real significance will come when the technique is applied to other planets. "I agree we all have in the back of our brains that water is equivalent to life," says Tinetti. She doesn't believe HD 189733b itself will harbor life. That planet's surface temperature is an estimated 1,000 degrees K (more than 700 degrees C and 1,300 degrees F) on its sunny side, and scientists suspect it has very high winds  a hostile environment indeed. But if the technique to find water works on HD 189733b, then researchers can have some confidence of its applicability elsewhere. "It opens the doors to future measurement on planets that are a little bit more life-friendly," Tinetti says.